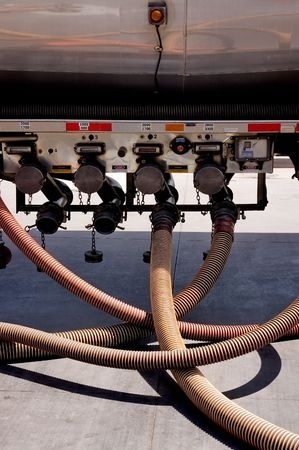 A terminal (or large depot) is a storage area where oil and/or chemical products are received through cross-country pipelines and/or marine vessels and are stored in a tank farm. These products are then redistributed by truck, barge, rail tank car (or wagon), and similar means. Yokogawa has accumulated more than two decades of experience in the automation of such terminals and has released a packaged solution, Terminal Logistic Suite VP. Manual operations at a terminal, such as manual loading/unloading and manual recording of bills of lading and bills of materials, are not only time consuming, but also can lead to injuries and unavoidable costs caused by human errors. Therefore, terminals with limited process automation solutions lack safety and efficiency, and might not be able to deliver products on schedule or that meet the minimum required specifications. Yokogawa's terminal automation solution, Terminal Logistic Suite VP, consists of level 3 solutions (production/MES layer) and level 2 solutions (control system layer). It satisfies the requirements of terminal customers in the oil, gas, LNG, LPG, chemicals and petrochemicals industries, without requiring a lot of customization work. The control system in this solution handles the loading and unloading of products at the terminal. Its functionality comprises all necessary monitoring and control functions for excellent terminal operation. Definitions of control properties can be downloaded from the MES into the controller for execution. The controller then executes the movement control function with ease and efficiency, and monitors the quantities transferred to ensure accurate control, while issuing alarms as necessary in response to inadvertent operations or equipment malfunctions. 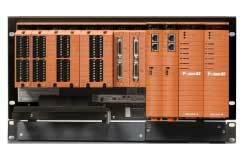 Control platforms can be selected to match the diverse needs of users. For example, a relatively small terminal for truck loading would use PLC (FA-M3), while a larger terminal would use either RTU (STARDOM) or DCS (CENTUM VP). To maximize overall operational efficiency at terminals, a good terminal control system to improve the loading speed is indispensable. However, it is also necessary to integrate the terminal control system with the terminal's Manufacturing Execution System (MES) to guarantee the seamless and smooth flow of information throughout the terminal to achieve overall operational excellence. Terminal Logistic Suite VP is Yokogawa's true level 3 (production/MES layer) terminal automation solution. It has direct links to the upper ERP layer and to the lower control system, in addition to a collection of separate modules for materials transfer, path generation, jetty/bay scheduling, production scheduling and other logistic operations. It addresses challenges for faster and more efficient delivery of products. It also provides flexibility for changes, improves safety, reduces administrative work, enhances the visualization of operations and improves traffic management, thus allowing operators to make accurate decisions. 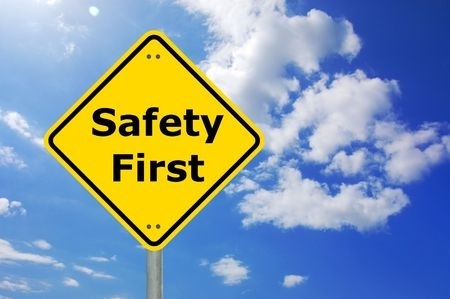 Safety is the first concern and top priority for terminal stakeholders, because it is the most critical element to ensure operational availability and profitability of the terminal in the long run. ProSafe-RS is Yokogawa's IEC61508 and ANSI/ISA 84 compliant safety system. Including terminals, it has been used in more than 1,500 projects, ranging from large-scale integrated process automation projects to stand-alone systems for small projects. 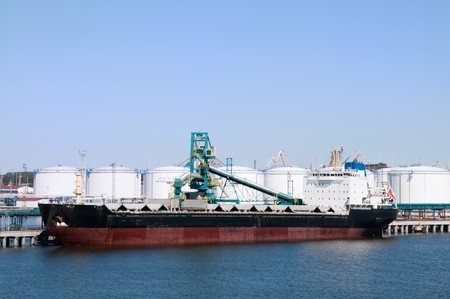 By monitoring the safety loops consisting of field sensors, safety valves and final control elements, Yokogawa's Prosafe-RS solution can help customers achieve true safety at their terminal. Yokogawa's Advanced Operating Graphics (AOG) solution is an enhanced redesign of the Process Control Station (PCS) graphics based on human factors engineering and knowledge engineering. AOG provides intuitive situational awareness through ergonomic design, such as color selection and layouts based on operating procedure and environment. Yokogawa has gained years of experience in automating terminals/depots and can provide concept-to-commissioning solution, based on proven technologies and its accumulated know-how for all your terminals. 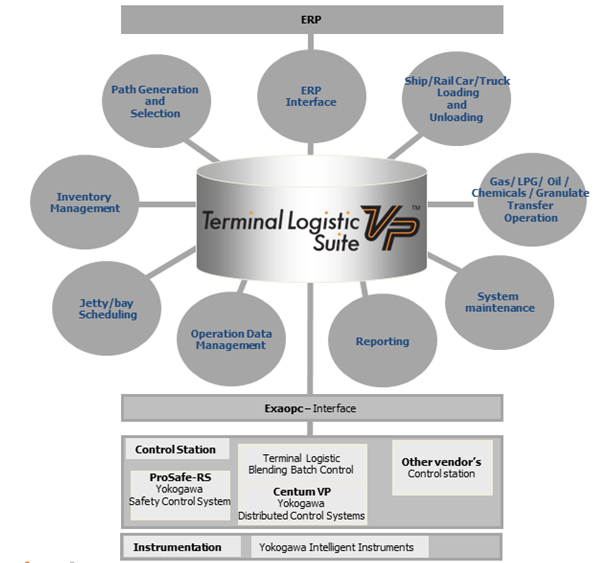 Yokogawa's Terminal Logistic Suite addresses challenges such as shortening the product delivery time, improving loading efficiency, adapting to changes in the manufacturing process, improving safety, increasing administrative efficiency, reducing labor costs, integrating data systems, visualizing operations and managing traffics, etc.